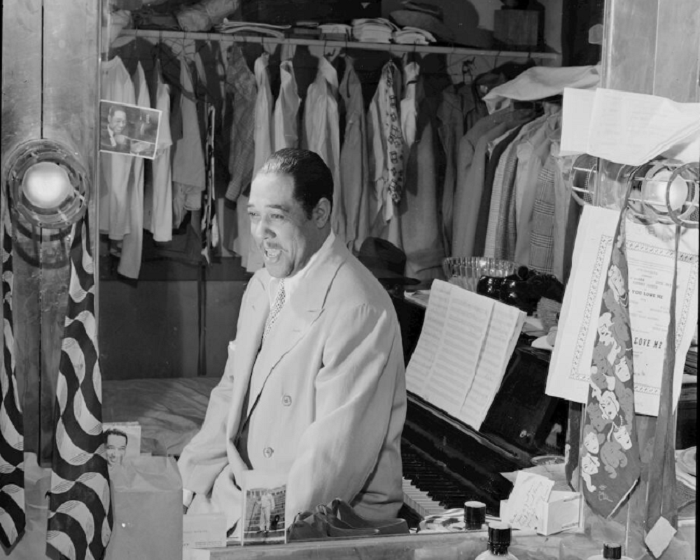 “Duke Ellington, with the mirror reflecting his always present piano, his conservative ties, his 20 suits, his 15 shirts, his suede shoes and his smiling self,” Paramount Theater, New York City, c. Sept. 1946, photograph by William P. Gottlieb. Courtesy of Library of Congress Prints and Photographs Division. 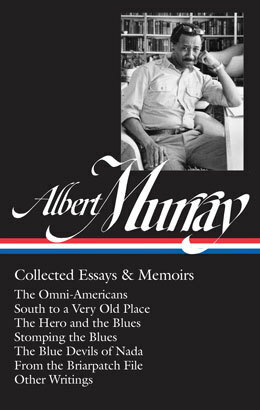 In his later book Stomping the Blues Murray similarly argues that Ellington is the “the most representative American composer” and compares him to “Emerson, Melville, Whitman, Twain, Hemingway, and Faulkner in literature.” And Ellington’s influence can even be seen in Murray’s four novels: “My attempt to suggest an image of the hero as improviser is Scooter, the first-person narrator . . . , in which I try to make the literary equivalent of an Ellington orchestration,” he wrote in 1989. In 1999, on the occasion of Ellington’s centennial, Murray was asked by The Village Voice to contribute a short piece, and he wrote the following account chronicling his transformation from one of Duke’s greatest fans to one of his idol’s friends. Notes: In his opening sentence, Murray refers obliquely to Kenneth Burke’s 1938 essay “Literature as Equipment for Living.” The book Ellington and Stanley Dance were “trying to put together” became the 1973 autobiography Music Is My Mistress. American diplomat Ralph Bunche was a key member of the U.N. team in the early postwar years. He received the 1950 Nobel Peace Prize for his work in the late 1940s on the Arab-Israeli truce in Palestine. Back in 1927, when I was eleven years old and in the fifth grade at Mobile County Training School on the outskirts of Mobile, Alabama. . . . If you don't see the full selection below, click here (PDF) or click here (Google Docs) to read it—free!